I love a good baked potato. Make it into a soup and it's even better. Nothing warms me up faster on a winter evening than the flavor combination of bacon, onion, cheese, butter and potatoes. Since learning that I have a child with a whey and casein allergy, I've searched high and low to find a good substitute for baked potato soup. I wasn't expecting perfection without true dairy products, but I wanted something that I could still make and enjoy with my entire family. After months of searching and trying out different recipes, I finally concluded that there just wasn't a good substitute for baked potato soup. 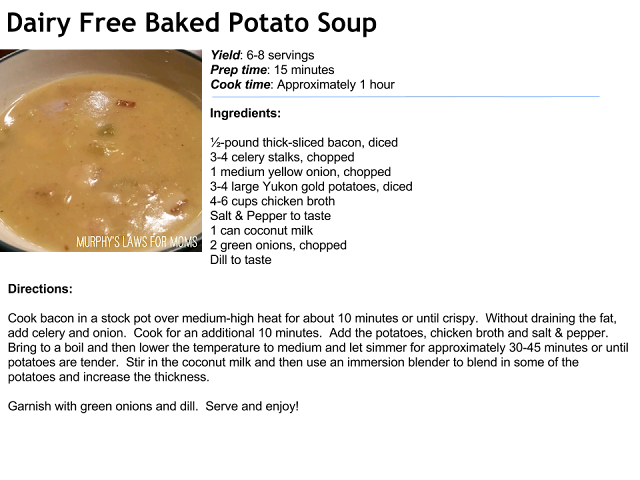 Then, after discussing this problem with a friend, we came to the conclusion that, if we couldn't find a good dairy-free baked potato soup, we'd just have to make our own and recognize that it wasn't going to taste like a dairy-filled soup. We'd have to find a flavor combination that made it something all on its own. So, we began creating. I thought of all of my favorite dairy-free ingredients that I like to have on a baked potato: bacon, onion, salt and pepper on top of a well-cooked Yukon gold potato. The bacon is, by far, the ingredient I enjoy the most, so I decided that this was to be my foundation. 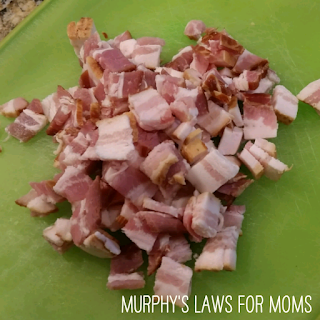 I chopped about a half pound of high quality, thick sliced smoked bacon that I found at my local butcher shop and cooked it in a stock pot for about ten minutes. Without draining the fat, I then added 3-4 celery stalks washed and chopped, along with one chopped medium yellow onion, and cooked this with the bacon for another ten minutes. 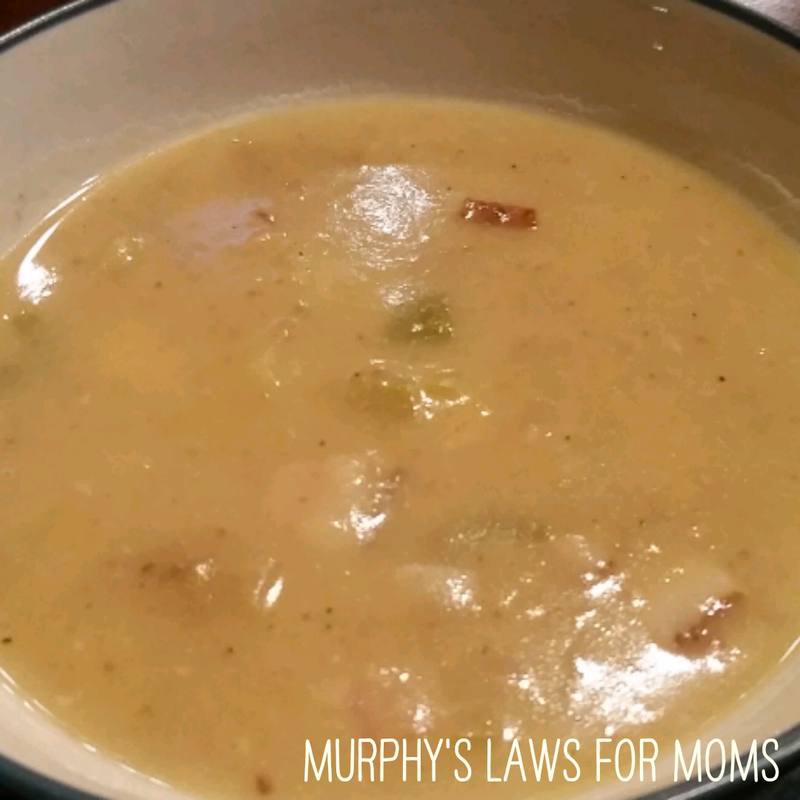 Although the celery wasn't on my original list of ingredients, it added a bit more texture to the soup that I felt was missing from prior attempts. After cooking the vegetables and bacon together, I added about 3-4 large gold potatoes, chopped into bite-size pieces. 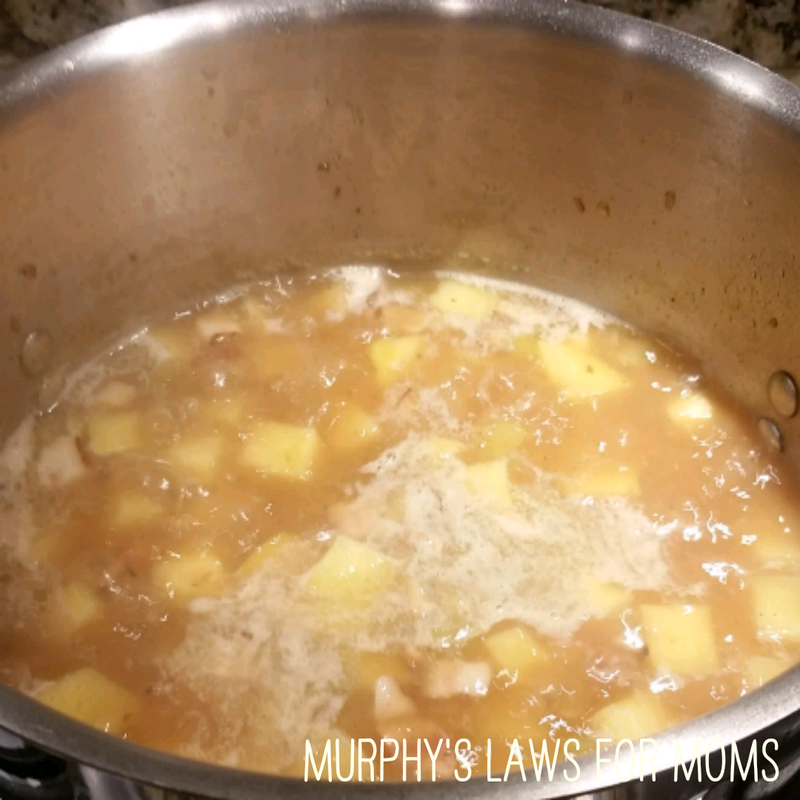 On top of this, I added approximately 5 cups of turkey broth that I had leftover from my homemade Thanksgiving turkey stock (chicken stock also works) and salt and pepper to taste. I let this simmer for about 30-45 minutes until the potatoes were tender and a fork could easily push into them. Even though I tried desperately to create something that did not rely on the creamy, cheesy goodness of a true potato soup, I couldn't quite bring myself to not adding some form of dairy substitute. The creaminess of the soup, after all, is what makes it so comforting on a cold, winter night. So, I added one can of coconut cream - a great substitute for heavy cream. Then, instead of adding a butter/flour mixture to thicken up the soup, I used my immersion blender and blended some of the potatoes into the soup to increase the thickness - also making the soup gluten free. I served the soup with some chopped green onions and a dash of dill to add more flavor to the soup. The members of my family who were able to consume dairy chose to add some shredded cheese to the top, as well. Overall, I learned that you cannot expect a comfort food rich in dairy to taste the same when using dairy substitutes. But, this doesn't mean you cannot still enjoy them. Learning to find a flavor within the food that you want to stand out (in this case, the bacon) will help you find an appetizing way to prepare your dairy-free meal.